The Off-Road Expo offers a ton of entertainment and interactive features for those in attendance including exhibitions, demonstrations, hands-on activities like the Toyota Ride-N-Drive, the Off-Road.com girls and more. Pomona, CA (PRWEB) September 26, 2008 -- The 2008 Off-Road Expo sponsored by Toyota, the nation's largest off-road consumer products show series, will roll into the Pomona Fairplex Friday, October 3 through Sunday, October 5. The show features everything off-road including new vehicles and parts, on-site show deals, freestyle motocross action and more. New activities this year include photo shoot opportunities with the Off-Road.com Girls, live music and an enhanced Kids Zone, providing jam-packed entertainment for the entire family. Also new this year, the Expo will open a day early on Friday, October 3, to allow more time for off-road fans to enjoy all the fun and action! Come Check Out The Off-Road Expo This October 3-5! "This year's Expo covers more than 20 acres with all the latest off-road vehicles, parts, accessories and more, making it the place to come talk to industry experts, check out new vehicles and demonstrations and take advantage of special on-site show discounts on thousands of parts and accessories," said Show Director Tom Gattuso. "The Expo is the best place for off-road lovers to share their passion with other enthusiasts, enjoy live entertainment and have fun." World Debut of Side X Side Super Jam Drifting Exhibition - From the founders of CalROCS and W.E. ROCK comes a competition featuring Side X Side drifting demonstrations on a figure-8 track! Dirt Alliance Dirt Lifestyle Showcase - A brand-new outdoor zone has been created that will feature live music from bands such as the Pricks, Divide the Day, Inhale and Seenless. W.E.ROCK Rock Crawling Demonstrations - Come and watch an exhibition of professional rock crawlers, including world-renowned Tracy Jordan and Dean Bulloch, compete in head-to-head trials in four-wheel drive rock vehicles. Toyota Off-Road Ride-N- Drive - Off-Road fans will be able to test brand new Toyota vehicles, including the Toyota FJ Cruiser, Tacoma and Tundra where it counts - on the dirt! Off-Road.com Girls - You've seen them online - now see them in person at the Off-Road.com Girls Photo Studio. Have the girls sign your poster, take pictures and share them with your friends on Off-Road.com. Special Appearance by Racer Ricky James - See 20-year-old paraplegic racer Ricky James in the SoCal Super Trucks booth all weekend sharing his story, greeting fans and signing autographs. 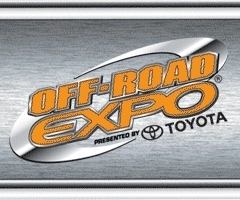 The Off-Road Expo presented by Toyota will take place Friday, October 3, from 2 p.m. - 8 p.m., Saturday, October 4, from 9 a.m. - 6 p.m. and Sunday, October 5, from 9 a.m. - 5 p.m. Held at the Pomona Fairplex, located at 1101 W. McKinley Avenue in Pomona, Calif., admission to the event is $12 for adults, $5 for children 6-12 and children 5 and younger are free. Tickets are available online at offroadexpo.com. Advanstar Communications Inc. (www.advanstar.com) is a leading worldwide media company providing integrated marketing solutions for the fashion, life sciences and powersports industries. Advanstar serves business professionals and consumers in these industries with its portfolio of 91 events, 67 publications and directories, 150 electronic publications and Web sites, as well as educational and direct marketing products and services. Market leading brands and a commitment to delivering innovative, quality products and services enables Advanstar to "Connect Our Customers With Theirs." Advanstar has approximately 1,000 employees and currently operates from multiple offices in North America and Europe.